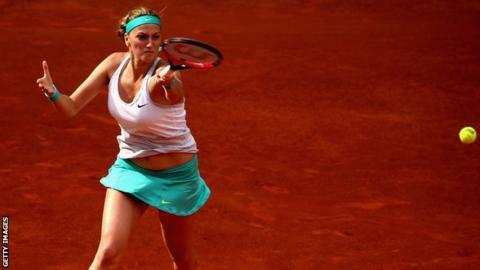 Petra Kvitova blended power and precision to crush Svetlana Kuznetsova 6-1 6-2 in the Madrid Masters final. Having ended Serena Williams' 27-match unbeaten run in the semi-finals, the 25-year-old Czech was far too strong for her Russian opponent. Kuznetsova, 29, took a medical timeout between sets and had no answer to Kvitova's ferocious hitting. "I feel very happy," said Wimbledon champion Kvitova. "I'm really glad that I won for the second time here." The world number four raced through the first set in less than half an hour, with heavy serving and returns frequently beyond Kuznetsova's reach. Kuznetsova returned for the second set with her left thigh heavily strapped and immediately dropped serve. Kvitova broke again for 3-0 and, though her opponent held serve in games five and seven, there was no way back.